ROAD TOWN, Tortola, VI- The war is waging publicly between the National Democratic Party (NDP) Government of Premier, Dr The Honourable D. Orlando Smith (AL) and BVI Airways; a defunct airline that Government provided $7.2M of tax payers money in exchange for direct flights to the Terrance B. Lettsome International Airport on Beef Island from Miami International Airport in the United States of America. It was on July 4, 2017, in a statement, that Premier Smith talked tough and called on BVI Airways to start the Miami-Beef Island flights without any further delay as his regime “has fully discharged its responsibility to BVI Airways by providing $7 million as a subsidy in keeping with the terms of the agreement." 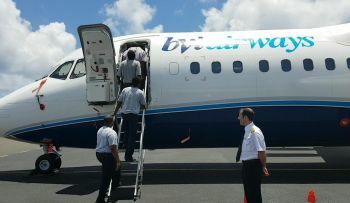 Now comes a bombshell from BVI Airways that it is immediately laying off its entire crew of pilots and flight attendants and has cast blame on the same Government that bailed them out and went as far as violating the agreement, after the money was to be paid out over three years, but the full amount was advanced within six months. BVI Airways then attempted to place the blame heavily on the NDP Government for its failure to begin direct flights. Some four announced flight dates have already been missed. According to BVI Airways, the current system is “antiquated” and barely works for low density flights and that there was a clear understanding from the onset that this needed to be corrected and better training of personnel provided prior to its launch of service. This news site had reported on July 5, 2017 that one of the problems affecting BVI Airways from taking off, despite it finally getting the necessary regulatory approvals was that it needed more money and in fact, approached Government for it but was denied, according to a senior National Democratic Party source. According to the BVI Airways press release today, the regulatory process also took much longer than all parties expected and has put a significant strain on the company's finances. Taking another shot at Government, BVI Airways said the Government’s ill-timed announcement of the contract award to lengthen the runway at Beef Island at an estimated cost of $155 million, made it much more difficult for BVI Airways to raise private funding. The controversial airline said it has been in discussions with the Government for months and is doing its best to raise the additional funds required and will start flying once the necessary improvements are completed and the additional funds are secured. While there has been no response from the National Democratic Party Government, who it seems will be left holding the bag since they will not get back a dime if BVI Airways never flies, Leader of the Opposition Hon Andrew A. Fahie (R1) exclaimed that the latest announcement by BVI Airways was “serious” since millions of dollars seem set to go down the drain. “This is serious! This is no joke! Over $13 million dollars and what will we have to show -- no airport extension -- no direct flights -- no transparency-- no accountability but the continuous hemorrhaging of the already scarce Territory's finances! How much are the people prepared to suffer?” Hon Fahie stated in a press release. Hon Fahie lamented that questions have been asked over and over in the House of Assembly about the contract in question, but usually no answers but always insults were given. “If we are going to be asked to fix this problem, we must be given the truth -- the whole truth and nothing but the truth!! The song writer was before his time -- Millions and millions and millions and more -- (you know the song!). “This is an ongoing pattern of reckless and irresponsible financial management that can only be directed to one office. 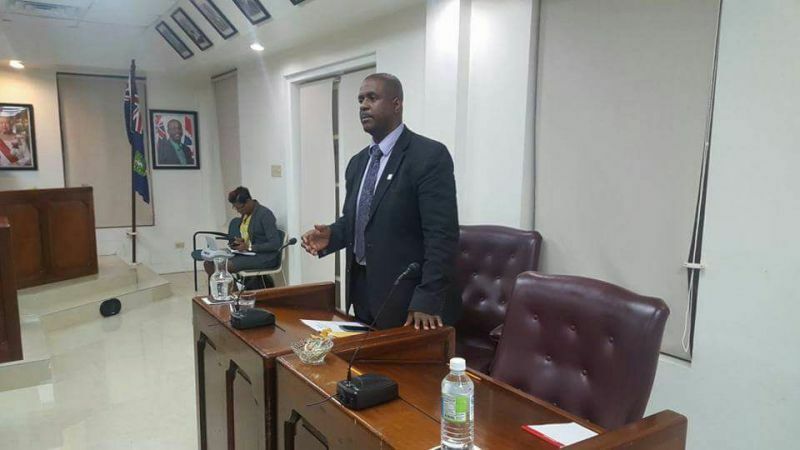 This entire situation will be examined further,” Hon Fahie concluded. Just waiting to see the comments !!! I wonder why this airline don't want to go to the bank to get a lone? Is it because of chapter 11??? Who would loan them money when the Government is saying that they will introduce direct competition by increasing the runway length. They should have either invested in an airline able to use the existing runway or lengthened the runway allowing large jets. Not both. Won't work. Remembering when I was a child listening to Officers. Plan 'A' never works. Plan 'B' is the real plan. Get to Plan 'C' or 'D'? Look melee who going to jail? Why was the airline operating between Haiti and Cuba if not to cover the costs? Are they saying our $7mil subsidized Haitian shopping trips? Surely the situation regarding airport resources, runway, approval time timetable were known factors. What a bunch of educated fools we have as "leaders". I wonder how many of us predicted this day was coming. Anything that is rushed into without proper planning is doomed to failure - will we ever learn? Why do we keep sending lightweight negotiators to heavyweight fights, and when they get knocked out, we act shocked. Dr Smith is talking tough and doesnt have a leg to stand on, meanwhile looks like a damn fool having promised time and time again that flights will start soon. Now the company that has shafted the BVI once before, has shafted us royally once again to the tune of 7 MILLION dollars. They have flown as many flights to Miami as the government has delivered "on budget" projects (i.e. NONE). For all of his promises, what did Doc get? thrown under the bus driven over....reverse and REPEAT! This is what you call a Major Blunder. We should have invested in our own (VI Airlink). We should have and watch the progress.. But the BVI does not want to invest in their own... ASHAME! The bible says what go round come round. All over BVI bvislanders are being oppressed hindered sidelined in favour of others and their pompous ways. This is just the same thing happening on a much grander scale. Now BVIslanders, the name BVI Airways belongs to a business of intended business. Can you please tell me who are the real owners of BVI Airways? I need you tp post pictures of the following for public viewing. Picture of the CEO, Chairman and all other Stake-Holders. Lets be fear. Corruption to the highest level with out leaders. This is a ploy to Force government to give out more Tax Dollars, Dr. Smith not another red centof our money and will sue them for $7m back plus legal cost. Set of wicked men. For an outsider such as myself, it's incomprehensible. What is up down there? Jail never closes. you can go up Balo (jail) anytime of the day or night. you think a local business could have gotten away with this? NEVER!!! governor John Duncan when will you make an arrest? BVI airways hasn't even began full operation as yet and they are already laying off staff ....Liat probably given Bvi airways advice!! Our solution to all these problems are simple..
this airline will never fly and the money is gone while local businesses are still owed millions by govt. I wonder how long the memory will be come election ? I hate to hear this vote out election revenge talk. Despite being voted out they would be receiving retirement money in addition to no punishment after doing so much wrong. So they still come out on top despite all the stupid talk bout "wait till next election". This crazy and is a white collar crime at its highest. I want to hear the Government response or twist on this. I do agree it seems as scam to take the people of the Virgin Islands tax money which could have been spent elsewhere to develop our health infrastructure, education infrastructure and our roads and so much more where value could be seen immediately or in the long term. This white collar crime needs to be investigated. The contract should be available as it should be registered given the value of the contract. If not the Government needs to be accountable and tell the people how the money was spent. Furthermore, I do not know who advise the Government to invest in such a risky venture. Bad advice. 95% of us knew it was a bad investment. Keep us wondering how can 11 intelligent people get so stupid...Something has to be in the contract stating that if the complete payment is not made within 6 months the contract is null and void. What Else could it be why they behaving this way...We need to see the contract..
Who is our lawyer buddy???? If that DAMN NDP crew was not so deep in the greedy sauce this Country would not be so f.,?$d up. If bvi airways can walk off with 7mil cash then why should the local bands be owed for festival.bands hold a meeting and boycot the festival village if yall ain't paid in full before performance on stage. Why they can and will get away with this it's because they know that the most will be done is to blog about it. They probably reading the blogs and having a laugh knowing what they got away with. @ same old, of course they are reading the blogs. If they choose to laugh at our blogs, let them go right ahead. Who laugh last always laughs the best. They will get caught up soon enough. Your NDP supporters must "own" the election results. How do you repeal and replace the BVI government? Why not give the money to the ferry companies to update their fleet. Get faster, bigger ferry boats to the USVI. We are quite willing to extradite our own people to the US for trial. I hope we are also willing to have the US extradite these airline managers to the BVI for trial. @john, what crime have they commit. You chatting piss. Am agreement was entered into which the NDP failed to honor. They were blindsided with the agreement and I doubt Dr. Zzzzzzzz really knows what he signed. The people trick him big time. We begging to lock them up. Then we will be begging to let them go them is locals.